First, thanks to Jim Thompson for handing us his megaphone for the day. We appreciate the opportunity to further the important conversation about road safety. In his recent editorials on sharing the road, Jim asked why transportation advocates—BikeAthens is Athens only transportation advocacy non-profit—were not speaking out about cyclist traffic infractions. So why the silence? 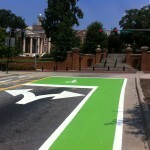 Does BikeAthens tacitly support reckless riding and “scofflaw” cycling? No, of course not. 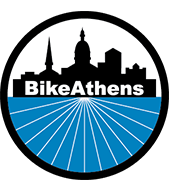 In fact, since BikeAthens founding 20 years ago, we have made education a pillar of our mission to make walking, cycling, and public transit an everyday solution to transportation needs in Athens. After receiving a grant from the Governor’s Office of Highway Safety, we have expanded our educational programs to teach more people how to safely, confidently, and responsibly ride on Athens wonderful streets. BikeAthens does not usually talk about “scofflaws” because we are busy directly engaging the public through classes, rides, and other outreach events. Our proactive education programs are more effective at changing rider behavior, promoting our mission, and improving safety for people on bikes. It should go without saying: BikeAthens is dismayed when we hear of a cyclist riding irresponsibly. The actions of a foolish rider can tarnish all cyclists’ reputations and hinder BikeAthens mission. Fortunately, these incidents are rare—indeed they are memorable for their rarity. And certainly “scofflaw” behavior is not confined to those on two wheels. By contrary example, how long would the list run if we noted every texting driver, every person who exceeds the speed limit, every truck that fails to give three feet when passing, every SUV that runs a stop sign, or every car that hits and kills a cyclist or pedestrian. In our experience, putting a spotlight on outlier behavior does not create an atmosphere conducive to thoughtful dialogue; nor does it change behaviors. It only creates a divisive, false dichotomy between cyclist and motorist by casting aspersions on all riders. Scofflaw incidents involving any vehicle are frustrating for driver, pedestrian, and cyclist alike. But rather than reacting piece meal to anecdotal reports, BikeAthens looks at the bigger picture. In developing the curriculum for our cycling programs, we combed through crash data analysis provided by the UGA Traffic Safety Research and Evaluation Group (TSREG) for both Georgia and Athens. Patterns emerged at the state level. The data tells us that for improving cyclist safety conspicuity is the key. As a result, we teach both kids and adults to Ride Right, Ride Bright! We distribute and install free bike lights at public events. Our t-shirts feature a rider with lights and a reminder to flow with traffic lights. We hope our efforts to help cyclists Get Noticed will reduce crashes. This is concrete, data-driven advice that we share on a daily basis. As I mentioned earlier, we do not read the police blotter and comment on rider behavior because we already spend a majority of our time teaching responsible road use. Through our Municipal Court Ticket Diversion program we reach 30-50 people a month. Even better, the class is targeted at folks who have committed on-bike traffic infractions. We aim to eliminate repeat citations. At our monthly group rides, the first Friday of every month, we model proper riding behavior. We lead Safe Route to School rides and work with kids to instill good riding habits at a young age. We have frequent commuter assistance days at the Athens Farmer’s Market to talk to both cyclists and non-cyclists about the best methods for navigating the Classic City. Even our “Get Noticed” t-shirts encourage riding with traffic and using lights to stay visible. Indeed, we emphasize safe riding at all times. Rather than calling attention to the infrequent case of motorists or cyclist scofflaw behavior, BikeAthens will continue working in the community, to provide in-depth, constructive, and effective cycling education to as many people as possible.